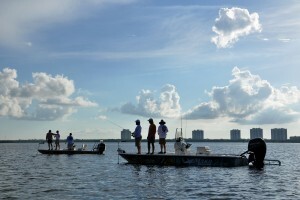 A Fort Myers, Florida, resident, Brian Peachey, is a Marine veteran who organizes an annual fishing competition to honor troops. 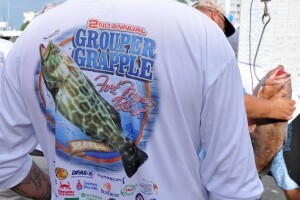 The Grouper Grapple Offshore Fishing Tournament proceeds go to the Marine Corps Association Foundation, and this year, Brian invited Freedom Alliance to bring service members to take part in the event. We met Brian through Tunaskin Aquatic Apparel, which is a key sponsor of the tournament. Our Tunaskin friends provided our guests with custom shirts, labeled either USMC or ARMY, and featuring vivid artwork by Dennis Friel Art Studios, which also give abundantly to Freedom Alliance. We found eight admirable servicemen able to participate, from Florida, North Carolina, and all the way in Wisconsin. Staff Sergeant Christopher served as an explosives technician in Afghanistan. In 2011, he was seriously injured in a blast during a clearing mission, and he retired from the Marine Corps last year. John is another Marine, who has recently moved to Florida from Wisconsin. He was wounded while in Afghanistan with the 1st Battalion, 11th Marines. Infantryman Matt deployed to Al Qa’im, Iraq, in 2005, and again to Helmand Province, Afghanistan, in 2010 for Operation Moshtarak. He is from St. Augustine, Florida. Dan is retired from the Army since losing his leg in combat in Afghanistan. He recuperated at Brooke Army Medical Center in San Antonio, Texas, and he and his family has since moved to Cape Coral, Florida. From Camp Lejeune, North Carolina, we brought Sean, who is recovering from a traumatic brain injury at the Wounded Warrior Battalion, and Mike, who was shot twice during two deployments and still active-duty with the 8th Marine Regiment. First Sergeant Tim is a 20-year veteran of the Marine Corps, having served multiple deployments and receiving two Purple Hearts. Scott is also a medically retired Marine, who survived an explosion that killed all his comrades-in-arms during a vehicle patrol in Iraq. Tim and Scott joined us from Madison, Wisconsin. 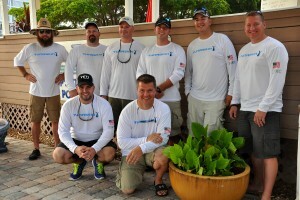 Once at the Fort Myers Beach, the Freedom Alliance team lodged in the lovely Wyndham Garden Hotel, which is located right across from Fish-Tale Marina, the site of the competition and festivities. Our host, Brian, treated us to dinner at the hotel’s seafood restaurant with sponsor Larry Frost, of Sherwin-Williams, and other veterans. The service members bonded straightaway over the meal, and Brian, a Marine himself, understood immediately how therapeutic this “real talk” was. Initially unconnected, from different parts of the country and different branches of military, all were friends by the end of the night. 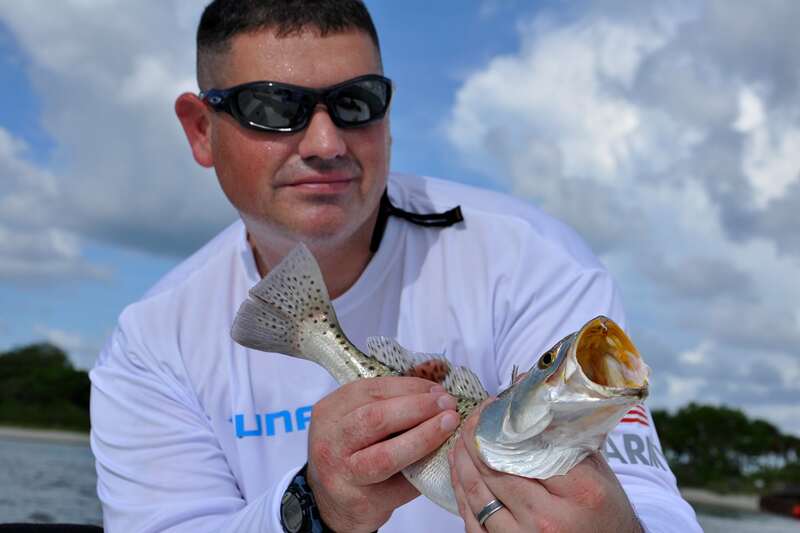 Several fishing charters, including Alex Dolinski’s Spot On Charters, donated their vessels and services to Freedom Alliance for a half day of backwater fishing, resulting in catches of red fish, pompano, snapper, catfish, and a boatload of trout. A local manatee ceremoniously surfaced next to one of the boats to greet our troops. Then all the participants gathered for the Captain’s Meeting, during which Brian stated the rules of the tournament and the teams completed registration. Our military guests mingled with local fishermen, telling stories and sizing up the competition. In the morning, we boarded boats, most of us on a pontoon piloted again by Alex Dolinski, a most excellent captain. The men pulled in more trout, a small shark and a manta ray taking the bait as well. It was thrilling to watch dolphins playing in the surf, only 20 yards from the boat. We practiced the hook and cook procedure again that afternoon, trying out a different eatery and achieving the same delicious outcome. 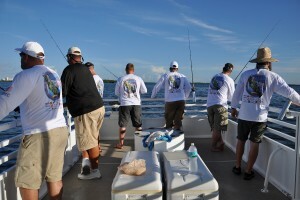 By late afternoon, the Grouper Grapple teams were making their way back to the Fish-Tale Marina for weigh-in. At 8 o’clock, Brian prepared to read the results of the tournament for all the teams and onlookers. He asked the Freedom Alliance guests to take the stage, and he gave each a commemorative plaque while the audience heartily applauded. Later, when Brian announced the winner of the fifth place in the tournament, the team without pause turned their $500 over to Freedom Alliance. Moved by their selflessness, the other crews followed suit, and the second-place team, “Snake in the Grass,” gave more than $2,500! 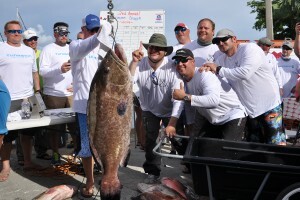 The grand winners, with a 79-pound grouper, “Twin Bruddas,” agreed to send a portion of their winnings to Freedom Alliance. Al Durrett of Fish-Tale Marina donated as well, and the Grouper Grapple went above and beyond, picking up the tab for our accommodations, airfare, and most meals. It was an evening of great charity and support. Satisfied, the men left the next day with new friendships intact, knowing that the most important part of the event was not that they shared space on a boat or in a tournament, but that they shared themselves with one another. Profound thanks to Brian of Grouper Grapple and all the other sponsors and donors for making it possible for Freedom Alliance to make this difference in the lives of our heroes.